Inclusion criteria: Age >= 18 years, out-of-hospital cardiac arrest of presumed cardiac cause, unconsciousness (Glasgow Coma Score <8) after sustained return of spontaneous circulation (ROSC) (20 minutes of circulation). Exclusion criteria: Conscious patients, pregnancy , out-of-hospital cardiac arrest of presumed non-cardiac cause, cardiac arrest after arrival in hospital, known bleeding diathesis, suspected or confirmed acute intracranial bleeding, suspected or confirmed acute stroke, temperature on admission <30°C, unwitnessed asystole, persistent cardiogenic shock, known limitations in therapy, known disease making 180 day survival unlikely, known pre-arrest cerebral performance category 3 or 4, >240 minutes from ROSC to randomisation. Primary outcome: Survival to end of trial (at least 180 days). Secondary outcomes: Composite outcomes of all-cause mortality and poor neurological function (Cerebral Performance Category (CPC) 3 and 4 and modified Rankin Scale (mRS) 4 and 5) at 180 days. All – cause mortality and CPC and mR S at 180 – days. Adverse events: Bleeding, pneumonia, sepsis, electrolyte disorders, hyperglycaemia, hypoglycaemia, cardiac arrhythmia, renal replacement therapy. 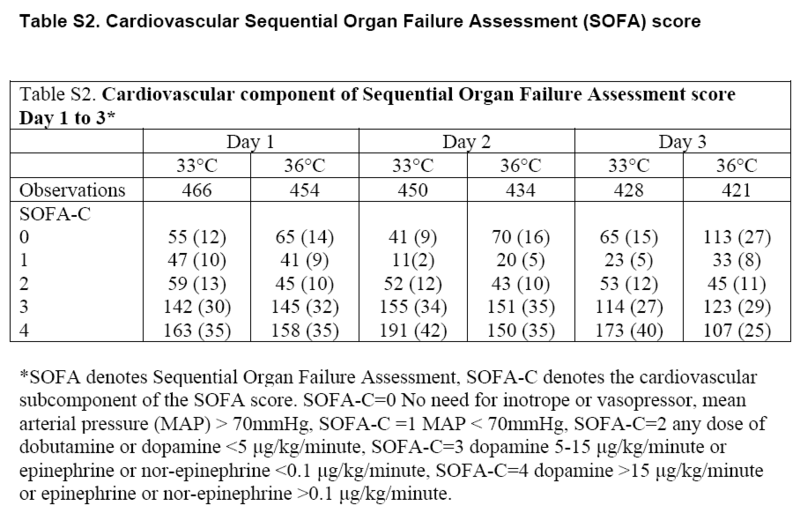 *SOFA denotes Sequential Organ Failure Assessment, SOFA-C denotes the cardiovascular subcomponent of the SOFA score. SOFA-C=0 No need for inotrope or vasopressor, mean arterial pressure (MAP) > 70mmHg, SOFA-C =1 MAP < 70mmHg, SOFA-C=2 any dose of dobutamine or dopamine <5 ìg/kg/minute, SOFA-C=3 dopamine 5-15 ìg/kg/minute or epinephrine or nor-epinephrine <0.1 ìg/kg/minute, SOFA-C=4 dopamine >15 ìg/kg/minute or epinephrine or nor-epinephrine >0.1 ìg/kg/minute. All patients in the trial were actively treated until a minimum 72 hours after the intervention period, i.e. after rewarming, when neurological evaluation was done on patients not regaining consciousness. (3) because of ethical reasons described below. Minimum 72 hours after the intervention period: persisting coma with a Glasgow Motor Score 1-2 and bilateral absence of N20-peak on median nerve SSEP. Should we change right now? Changes in Temperature Management of Cardiac Arrest Patients Following Publication of the Target Temperature Management Trial. Crit Care Med. 2018 Nov;46(11):1722-1730. doi: 10.1097/CCM.0000000000003339. Scott Weingart. EMCrit Wee – The Targeted Temperature Trial Changes Everything. EMCrit Blog. Published on November 18, 2013. Accessed on April 23rd 2019. Available at [https://emcrit.org/emcrit/emcrit-wee-targeted-temperature-trial-changes-everything/ ]. NOTE: These are more questions for my own learning (I’m new to this whole EBM thing). Take any of these with a pound of salt. Why are the p-values in the NEJM study so high for most of their findings? The studies were both well done with regards to methodology. The NEJM study had a very good bystander CPR rate (median 1 min for both groups). What was the rate of bystander CPR in the original studies? Another question – what were the vent settings used/how was oxygenation managed in these patients? What were the PaO2 values at each time-point for the TH vs 36 deg C groups? We know that hyperoxia alone +/- TH/TTM will worsen outcomes. Just wondering. Would “lumping” the VF/VT arrests in with the asystole/PEA arrests change the numbers at all? There is an excellent power analysis on the stemlyns blog. This study was powered to find an 11% difference between the 33, and 36 degree group. For a stat. sig. 2% difference (NNT 50 (i.e. ASA in MI, TSA in trauma)) sample size would have needed to be 20,000. This is holding trials such as this up to a much different standard than any of the other clinical trials out there that compare a new therapy to standard care. To say a 1000 patient hypothermia study doesn’t do much is probably to set one’s expectations way too high for future research. Also, it is interesting to note how St. Emlyn’s mentions CRASH 2. This trial did manage to enroll a cohort of ~20 000 pts. Running a RCT of that scale for TTM at 33 vs 36 would be possible and has been done for RCT’s of other interventions – one of the the only problems being that the logistics would be (VERY) nasty. Any future RCTs will have this problems as advancement in medical care kicks in. As mortality drops, we need bigger sample size. The solution is either change the primary outcome (ie MOPETT trial) or bundling it in al together (ie EGDT). However even if we were unable to find 20 000 pt to validate the 2% differences, it is too small and the benefit and conveniences of 36 C is too great to pass. For us who has not even started TTM extensively due to practicality/cost/logistic issues, this study is a gift from heaven. If you set the goal on your cooling caths to 35 or 36 now, that is an ENORMOUS change. The catheters we use are very, very good – when you dial in a temp, that’s exactly what you get. Our real term audited figures are bang-on what we set the machine for. As such, I’d be happy aiming for 34-36 degrees and not expect to have any unanticipated overshoots to hyperthermia. Indeed, we currently use them for the controlled rewarming phase in our patients at the moment, and never have any overshoots whilst the catheter is in. I don’t think the jump to from 32 -34 t0 34 – 36 is massive. The HACA trial, for example, targeted 32 – 34; but if you look at their measured temp figures, none of their 75th centile readings hit 32 degrees sustained at any stage. John, Look at the Day 3 SOFA-C scores in the table I added above to see why that dial change on the machine may have big implications. SOFA C is just a surrogate marker of inotrope use though. We already know that hypothermia reduces inotrope requirements in cardiogenic shock, so would you not just chalk up the SOFA C variance as an observational vagrancy of the intervention itself? A perfect example of Confirmation Bias in action for the pair of us!! What’s the chat in your place Scott – is a protocol change likely? The original studies looked at shockable rhythms, this study at all rhythms. How does this study provide us evidence to change our hypothermia protocols for the shockable rhythms? this study looked at shockable + PEA, very few PEA. I would look at it as directly comparable to the pt pop. of the previous trials. Great podcast Scott, and key to point out as you did that 36 isn’t the old “standard of care.” I don’t think we’ve yet seen the last of hypothermia, and maybe really deep is better… Have you ever seen the vids of Peter Safar’s re-animated dogs? Yep! Some of my buds are talking about a multi-center RCT of 36 vs 31. Hi all – I’m presenting this paper at a meeting today so I’m enjoying reading everyone’s insightful comments! Phil – I think the Safar paper that you mention is interesting but it shows only that hypothermia can prevent primary neurological injury as the dogs got cooled 2 minutes into their arrests. Hypothermia to prevent anticipated primary neurological injury is well established, e.g. in cardiac surgery. In an unexpected arrest that would require intra-arrest cooling. The cooling that Nielsen et. al performed was some time post arrest (median 25 minutes to ROSC, cooling started < 4hrs post ROSC) and can only prevent secondary neurological injury which is related to inflammation, oedema, etc, rather than acute hypoperfusion/ischemia. That's not to say that deep hypothermia wouldn't be better in the post arrest scenario though….